It's been busy round here. But there is a lull in the storm this week so I've managed to get my proverbial in gear to get a prompt up for all of you - and hopefully for myself too. And so this week, I'd like you to be inspired by colour - navy, pink, mint and a hit of gold. Do you love this colour scheme as much as I do? I have all these colours in my New York kit that I put together shortly after my second trip this year - so that might be the way I take this prompt. 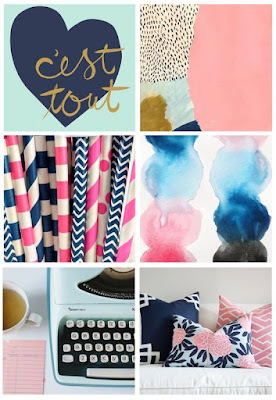 Then there'e the french phrase, the individual colours, the straws, the watercolour splotches, the gorgeous typewriter (need to get myself one! ), the geometric designs on the straws as well as the cushions. You might be inspired by the collection of designs on the cushions, or the comfy look to that sofa. Any single way this mood board can be interpreted is fine by me! We love it when you share so why not link up in our Whimsical Musings Flickr gallery here, with the tag WM#179.